Gold Coast city is a famous tourist destination in Australia where the sun, sea and sand comes into perfect harmony. This relatively new Australian city is located in the state of Queensland. The city also has a number of beaches where the surfers from different parts of the world comes to enjoy the thrill of the high waves. The city is also popular for its vibrant and exciting nightlife. Though the city was established in the year 1959 it has experienced exceptional population boom and has become the most populous cities in the country. The Gold Coast city Council is responsible for the administration of the city. The council is headed by the mayor and consists of 14 councilors. The councilors are elected at regular intervals. The city of Gold Coast has a sub-tropical type of climate and the weather is moderate and comfortable all round the year. The average annual rainfall is around 1428.6 millimeter. The average annual temperature ranges from 15.3 degree Celsius to 25 degree Celsius. There is rainfall almost throughout the year and there is no specific wet or dry season. The Gold Coast is perfect place to spend a day and also suitable for a long vacation. The versatility of the city, its sandy beaches, the perfect waves and the vibrant nightlife is mostly responsible for the flocking of numerous tourists from around the world each year. The Gold Coast city as the name suggests has a number of gorgeous beaches. Most of the beaches are ideal for surfing and the beaches are known as surf breaks. South Stradbroke Island, Tallebudhera Beach, Mermaid Beach, Surfers paradise, Rainbow Bay, Froggies beach and Nobby Beach are some of the beaches in this city. The world famous surfing beach called the Duranbah Bridge is located very near the city of Gold Coast. 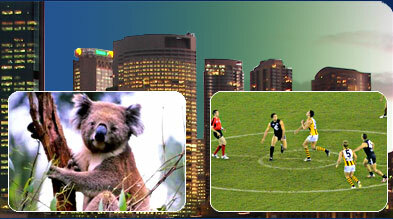 The major attractions of Gold Coast are it beaches and the beach walks. Most of the beaches are patrolled and the government takes necessary steps to ensure safety and security in the beaches. There are a number of theme parks in Gold Coast like Sanctuary Cove, Seaworld, Fleays Wildlife Park, Warner Bros Movie World and Dreamworld. The tourists can find a varied choice of shopping items and markets in this city. Pacific Fair, Australia Fair and Oasis Shopping centre are few places where the visitors can buy things on their holiday. Mt tambourine and the Springbrook National Park can be visited to take a break from the beaches. The restaurants in Gold coast are famous for excellent sea food and they also serve cuisines from various parts of the world. Apart from family restaurants there are alacarte restaurants, pubs and surf clubs. Gold coast Gondolas, Ristorante Fellini and Cav�s Steakhouse are the some renowned restaurants of the city. Gold Coast has its very own airport which is located at Coolangatta very near to the beach. There are buses, rail and monorail which help in the intercity transport.